As we began to discover in the first installment of our Historic Trains in Arkansas Series, Arkansas has a rich railroad history. 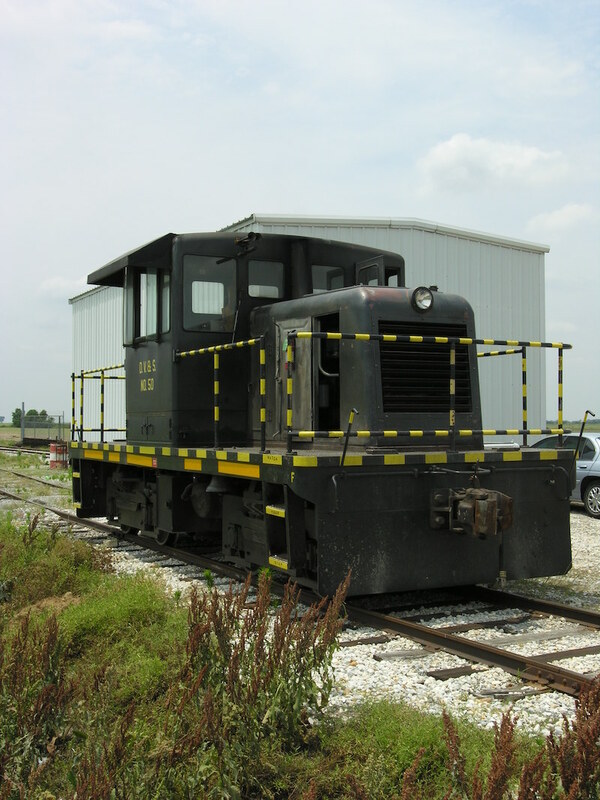 Historic train cars, cabooses and locomotives can be found in museums, parks, and on public land throughout the state and are on display for the enjoyment of kids, trains enthusiasts (railfans) and history buffs. Over time, improvements in technology and efficiency have led to changes in the way locomotives are built and used. The steam engine propelled the train industry. But as diesel engines became more cost-effective, steam locomotives were phased out in favor of cheaper and more reliable alternatives. Today locomotives continue to be classified by their source of energy. The diesel locomotive first came onto the scene in 1912 and continues to be used today. Other types of engines include electric locomotives which perform well and produce less pollution, hybrid locomotives which contain an onboard, rechargeable energy source, and most recently fuel cell-electric locomotives, which are powered by hydrogen. Although steam engines are rarely used anymore, they are impressive to look at, and several beautiful examples exist across Arkansas. Railcars transport goods and people and serve as the backbone to the train industry. Freight cars come in many shapes and sizes but haven’t changed much over time and are still widely used today. The design of passenger cars can vary, and modern cars often have air conditioning and other amenities added to them. Since freight cars and passenger cars are still widely used, not many examples are on display, but Arkansas does have several that hold historical importance. Arkansas Lime Co. No. 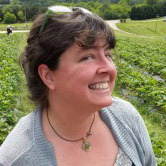 2, Photo by Julie Kohl. The Arkansas Lime Company No. 2 Steam Locomotive is on display in Riverside Park in Batesville. The 36” gauge locomotive was built in 1928 by H.K. Porter and was used on a two-and-a-half-mile section of track near the Arkansas Lime Company located in Ruddells, Arkansas. The Arkansas Lime Co. narrow gauge line, the last narrow gauge in the state of Arkansas, was converted to standard gauge in the early 2000s. At the intersection of Arkansas Highway 59 and West North Street in Decatur, Arkansas, sits a historic train depot and two historic railcars. The Kentucky-Southern Depot was built in 1920 and was added to the National Register of Historic Places in 1992. Beside the depot sits the Kansas City Southern Railway Locomotive No. 73D, an EMD F7A that was built in 1950 by the Kansas City Railroad. 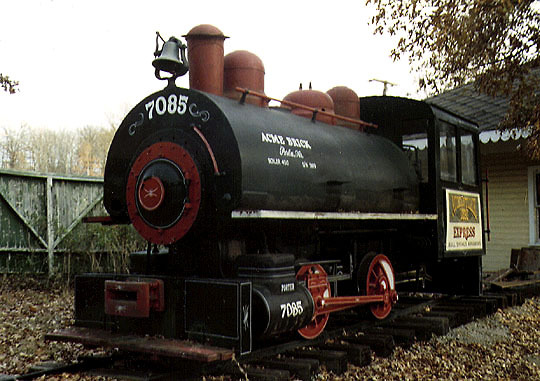 The locomotive was purchased and restored by Peterson Farms for display and was added to the National Register of Historic Places in 2006. The M&NA Combine car located in Bald Knob is believed to be the last known surviving wooden M&NA passenger car. It was built by the St. Charles Car Company in 1894 for the St. Louis, Iron Mountain & Southern Railroad but was later transferred to the Missouri & North Arkansas Railway. The car sits beside the Mopac Depot in Bald Knob where it was moved on June 14, 2007. 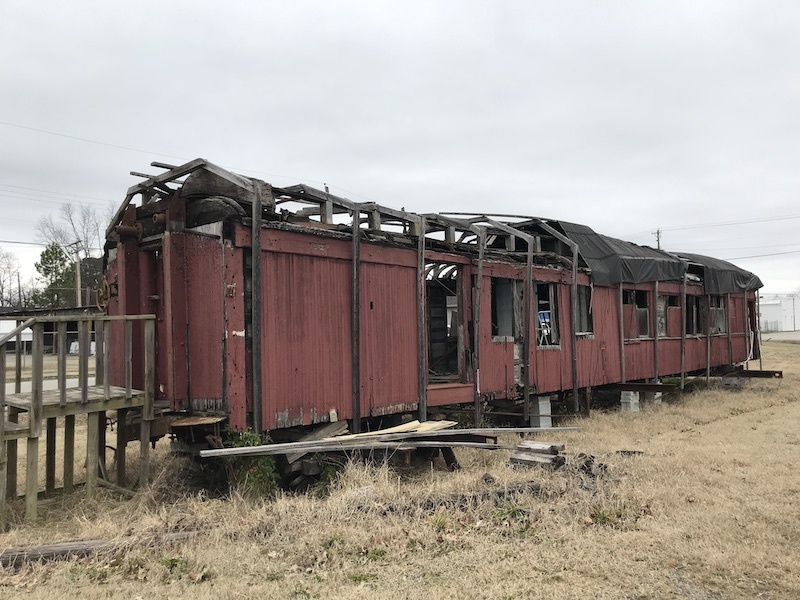 The White County Historical Society moved it for preservation and restoration as part of a new rail equipment exhibit although it still sits in a state of disrepair today. Around 1937, the car was converted to a “Jim Crow Car” and was put into standby service between Kensett and Helena. Because the car was used as a residence for some time, many changes were made to the interior, but examination suggests that there was a partition installed that would have met the laws of the time requiring separation between “white” and “colored” passengers. Historical documents have the car listed as a “coach-mail” car. It would have been used for passenger travel as well as to transport mail. Records indicate that it was originally designed to carry 36 “white” passengers but was later modified with a partition and additional toilet which changed the capacity to 20 “white” and 14 “colored” passengers. No. 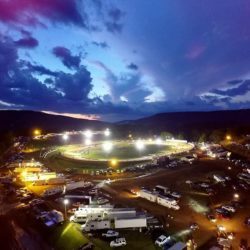 360, Photo provided by Robert David Grant. The Dierks Lumber company was one of the largest landholding entities in the United States with almost 2 million acres of timberland. 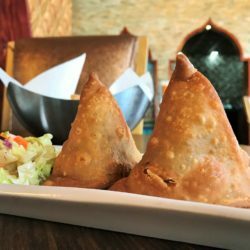 In the early 1900s, they purchased land near De Queen and established a logging camp. 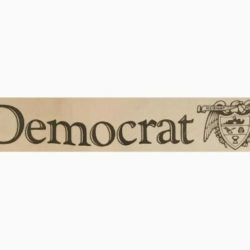 In 1910 the TO&E was incorporated by Dierks Lumber as an extension of the current rail line from the Arkansas state-line to Valient, Oklahoma. At some point, the #360 was transferred to Dierks. Known as the Dierks Forests No. 360, this ten-wheeler (4-6-0) oil burning locomotive was built for the Texas, Oklahoma & Eastern (T0&E) Railroad in Schenectady, New York in 1920. 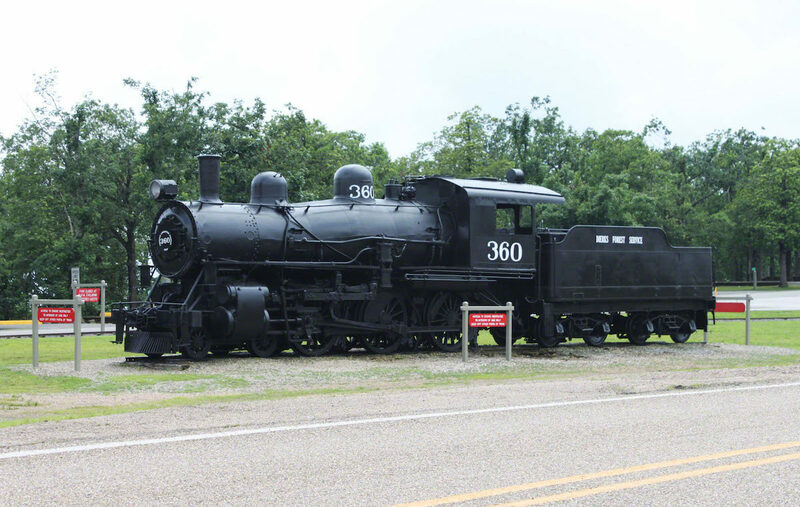 The locomotive was donated to the state of Arkansas at some point and is now displayed at the Queen Wilhelmina State Park in Mena, Arkansas. Engine No. 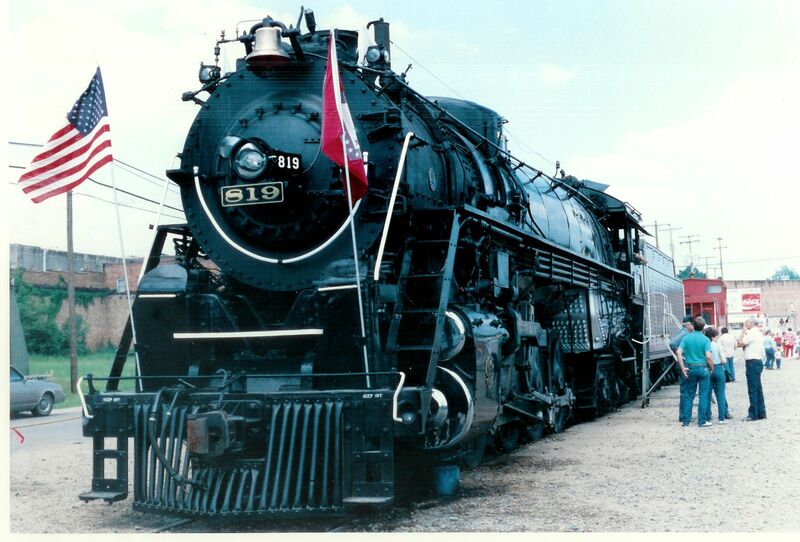 819 at the Fordyce Cotton Belt Festival in 1986. Public Domain. 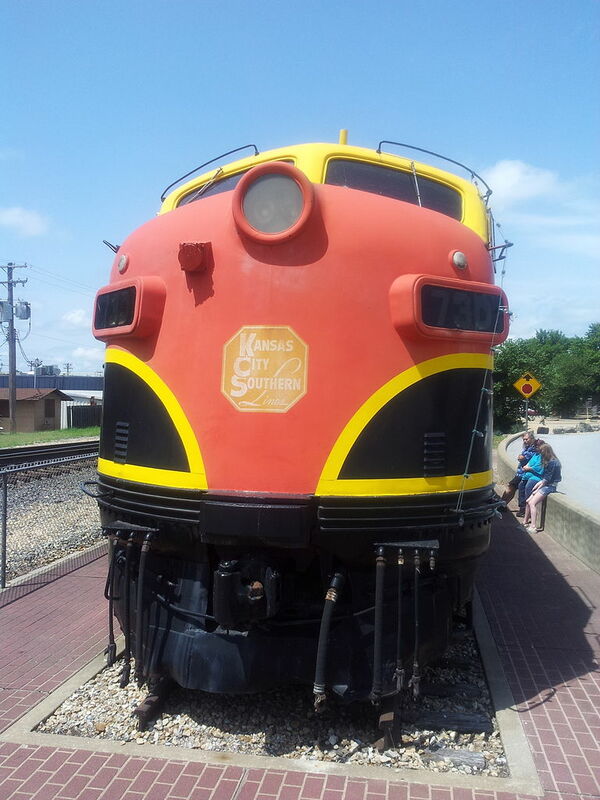 While many train cars came to Arkansas by way of other states, the St. Louis Southwestern #819 is special as it was the last locomotive built in Arkansas. The Cotton Belt operated a shop in Pine Bluff where five locomotives were built from 1937 to 1943. The 819 was placed into active service on February 8, 1943, and traveled 804,000 miles over the next ten years until the use of diesel engines forced it to be retired. The engine was gifted to Pine Bluff in 1955 by Cotton Belt’s president, but within several years the city had failed to maintain the engine, and she was falling into a state of disrepair. The 819 eventually moved to a new location where a local railfan named James Norris looked after the engine and opened the gate for visitors every Sunday until he had to stop due to failing health in the late 1960s. By the 1980s the locomotive was once again in a terrible state of disrepair. In 1983, in a combined effort between Cotton Belt employees and historical railroad groups, the engine was placed back on the rails for the first time in thirty years and transported back to the shop where it was built. 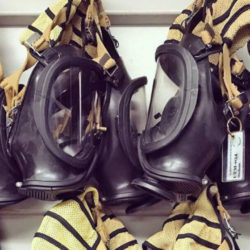 The restoration project became known as “Project 819,” was completed and financed entirely by volunteers working six days a week and took nearly two years to complete. The engine which has made several excursions since its complete restoration now sits on display at the Arkansas Railroad Museum. It was added to the U.S. National Register of Historic Places in 2003. Merci Train, Photo provided by G. Gerard. 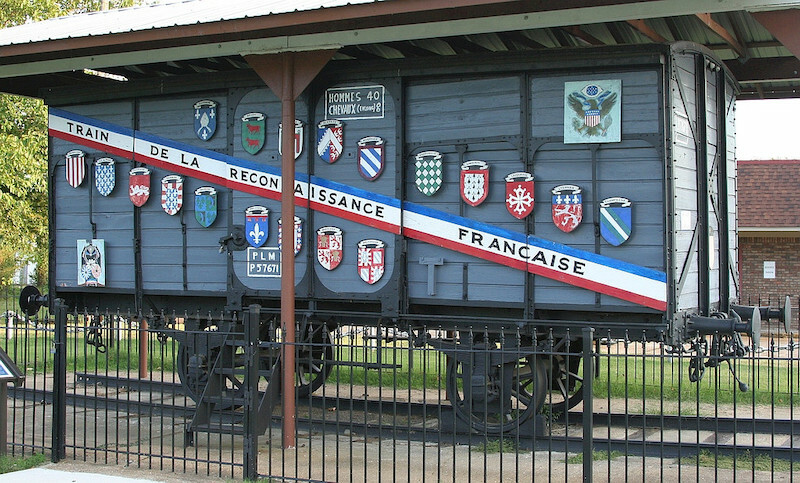 Following World War I, France wanted to show gratitude to the American people for their sacrifice in protecting French soil, so 49 French train cars were filled with gifts and sent to America. One train was sent to each of the 48 states, and the 49th was to be shared between Washington, D.C. and the Territory of Hawaii. Arkansas’ train car was sent to Helena where it was displayed at the Richard L. Kitchens Post #41. Constructed in 1922, the building is one of Arkansas’ oldest American Legion posts. In 2012, sixteen-year-old Tristan Ainsworth undertook a major renovation project to restore the train car as a project to achieve Eagle Scout. The train’s roof needed complete replacement along with other work, and the project took nearly 120 man-hours and 11 volunteers to complete. Mountain Village 1890 is a recreation of an Ozark settlement in tribute to the people of that era. The village contains several historical structures, but train lovers will be interested in the 1903 depot which came from Pryatt, Arkansas and the Acme Brick Co. Steam Engine No. 7085 is on display next to the depot. Built in 1940 by H.K. Porter in Pittsburgh, Pennsylvania, this narrow-gauge engine is half the size of traditional locomotives. Mountain Villiage will open for the 2019 season on March 15. No. 2522, Photo provided by Robert David Grant. Built in 1898 by the Cooke Locomotive & Machine Co., the No. 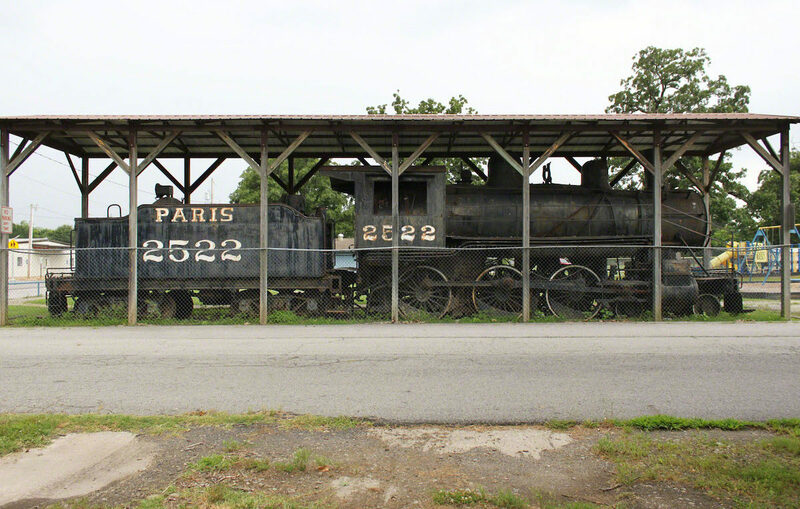 2522 Steam Locomotive on display in Paris, Arkansas is believed to be the oldest in the state. Originally built for the Saint Louis, Iron Mountain & Southern Railroad, the locomotive was later sold to the Fort Smith, Subiaco & Rock Island Railroad. In 1963 it was purchased by the Malvern Iron & Metal Co. in Paris before being bought by the City of Paris in 1966. One of the only two surviving of the original 128 steam locomotives owned by the Missouri Pacific Railroad, she is in a dire state of disrepair and has suffered corrosion from the elements. In early 2018, a local group hosted an auction and fundraiser to raise $20,000 to have the train moved to the museum across the street to be renovated. Fundraising was successful, and the train is currently scheduled to be moved in early 2019. DV&S NO. 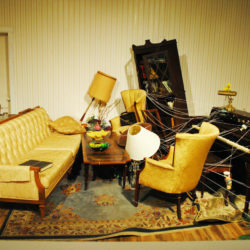 5, Photo provided by Arkansas Historic Preservation Program. Although this locomotive was an excellent example of Arkansas’ shoreline railroad history, it appears to have disappeared. Have you seen this train? The cover photo of this article depicts the Delta Valley & Southern Locomotive No.73. It is on display near Victoria/Osceola in eastern Arkansas. The photo was provided by G. Gerard. 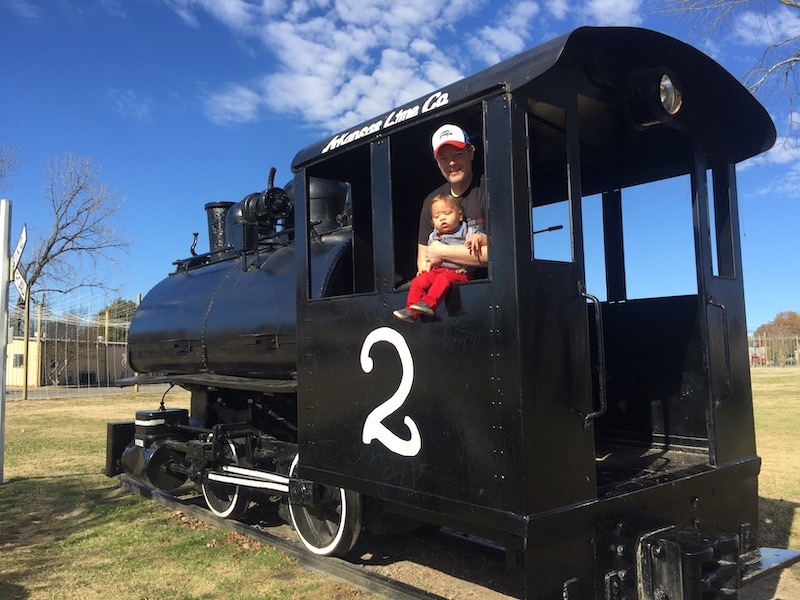 Don’t forget to check out our first installment of Historic Trains in Arkansas — Cabooses and be sure to check back soon as we take a look at a few of Arkansas’ historic train depots.